Widely distributed throughout Canada and the United States, American toads (Anaxyrus americanus, formerly Bufo americanus) are adaptable and hardy, making them fairly tolerant pets. Raising them from tadpoles is not quite as straightforward as it sounds, because you have to provide two different environments: an aquarium for the tadpoles and a terrarium for the toads, and different diets for the different stages. The spawn of the American toad is distinctly different from that of frogspawn, because it is laid in long strings rather than amorphous blobs. The eggs don’t require much in the way of care apart from regular water changes, just a freshwater tank mimicking the conditions of the species’ natural habitat. Note that American toads can lay up to 15,000 eggs at a time, which would produce far more tadpoles than even the largest tank could accommodate. If you’re raising eggs taken from the wild, don’t take more than a dozen or so. Each separate egg will show a distinct black dot at the center, enabling you to count the number of eggs in a length of spawn string. American toad tadpoles are primarily herbivorous in the beginning, eating algae and aquatic vegetation. Supplement whatever is already in the tank with boiled leafy vegetables and flake food for herbivorous or omnivorous fish. Crumble the flakes between your fingers for small tadpoles. Conduct partial water changes at least once a week, more frequently if you have a lot of tadpoles or the tank is small. For all stages of the life cycle, use dechlorinated or spring water. Water straight from the faucet contains chemicals that are toxic to amphibians. Once the toadlets are spending most of their time on the land area, transfer them to a terrarium set up with chemical-free potting compost, moss, bark, a shelter and a very shallow water bowl. Toadlets are perhaps the most difficult of the stages to feed, because they need very small terrestrial live food. Flightless fruit flies, pinhead crickets and very small worms are all suitable, but if you are struggling, contact a vet who specializes in amphibians for advice. If the original tadpoles or spawn came from a local pond, this might be a good point to release the toads back into the wild. Do not do this, however, if the species is not native to your area or the toads came from another area. If you decide to keep one or two of the toads as pets, they need a fairly large tank -- at the absolute minimum 2 foot by 1 foot by 1 foot, and preferably larger -- with the same terrarium habitat as the toadlets. 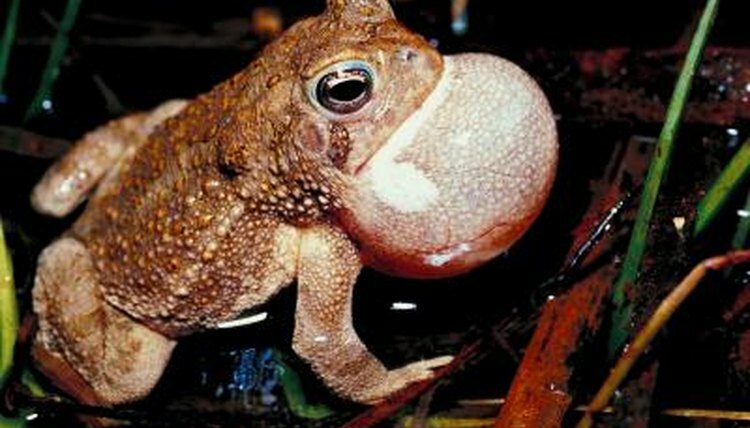 Live invertebrate prey that is small enough for the toads to swallow should form the diet. Crickets, mealworms and earthworms all make good snacks. If you decide to catch food from your yard, ensure that the bugs have not been exposed to insecticides and don’t belong to a toxic or venomous species. Most slugs would be acceptable, for example; wasps or hairy caterpillars are not. Powder their food with a calcium and vitamin supplement for amphibians a couple of times a week.